Start cooking the lasagna noodles in a large pot full of boiling water for 10 minutes, or until al dente. Put a bit of olive oil to avoid the lasagna noodle sticking together. Then rinse in cold water and drain. 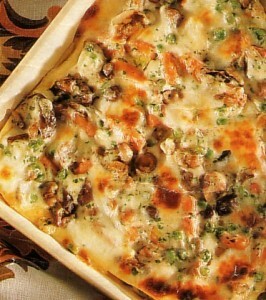 In a large pan, you can cook and stir in oil the mushrooms, together with green peppers, onion, and garlic. Stir in tomato sauce and basil and bring to a boil. After just reduce the heat, and start simmering about 15 minutes. Combine ricotta, the two cups of mozzarella cheese, and the eggs. Preheat your oven to 350 degrees F- 175 degrees C. Put carefully one cup of tomato sauce on the bottom of the baking dish. Layer then lasagna noodles, cheese mixture and sauce, sprinkle on the Parmesan cheese. Do again the layering, and top it all with the remaining from the two cups of mozzarella cheese. Bake uncovered for 40 minutes. After, let sit approximately 15 minutes before serving and enjoing. This entry was posted on Saturday, June 16th, 2012 at 5:22 pm	and is filed under Italian Recipes and Food. You can follow any responses to this entry through the RSS 2.0 feed. You can leave a response, or trackback from your own site.